Fuzzy? Touched up? Carmen Taylor's photo "has won several photojournalism awards". Back in June 2003 La Vanguardia in Barcelona, Spain, published an investigative report on the plane that slammed into the South Tower. 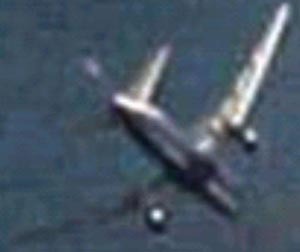 The report was a simple affair, it used the photo we see here on the left and wondered what these strange objects attached to the underside of the Flight 175 might be, and whether they were just an optical illusion. After a thorough digital image analysis by a Spanish university, the article came to the conclusion that the objects were three-dimensional in nature and could not have been caused by shadows or reflections. Full Stop. The Letters to the Editor page in La Vanguardia was soon flooded with readers complaining that the article had not explained what these objects could be, but the journalists refused to comment, they were investigative journalists and it was not for them to speculate on unknowns. Besides, La Vanguardia was a respectable, conservative newspaper with a hundred-year-old tradition to protect and they weren't about to get burnt with this Hot Potato, thank you very much. Surprisingly, despite all the film taken that day before so many eye witnesses, compared to the evidence we have on the other flights, very little is known about Flight 175. Which is why, here in the Kasbah, we thought it was very important to establish Eduardo Martín de Pozuelo and Xavier Mas de Xaxàs' article as a reliable reference and put it into English as soon as possible. This we did. However, not having "a hundred-year-old tradition to protect" we decided to delve a little deeper into the subject. 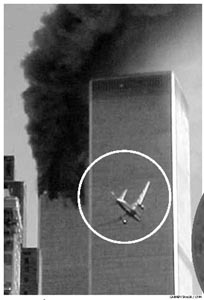 The digital analysis done by a Spanish university came to the conclusion that what we see here was no mere play of shadows as the plane banks into the South Tower, but physical objects. Obviously, no known commercial airport would have cleared a plane looking like this for take off. Not so obvious, perhaps, is fact that you don't just bolt on a few objects to the exterior of a plane and happily fly off again--aerodynamic drag alone would shear off any external appendages (even before reaching 500 mph) leaving behind a gaping hole. Commercial airliners are built as light as possible and consist of a structural airframe covered by a "soft" metallic skin. Before attaching anything to the outside of an airliner you would have to reinforce the interior with beams and mountings added to the airframe, producing what are known as "hard points" in military planes, where external munitions, missiles and extra fuel tanks can be safely hung. You don't modify an airliner like this in one morning.